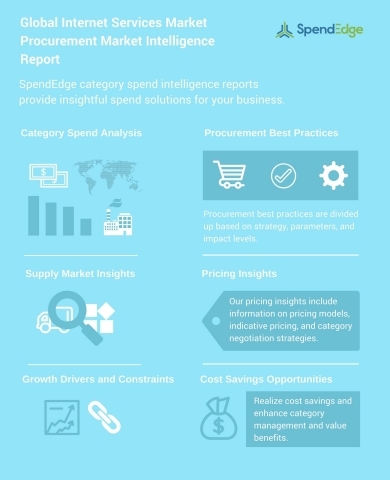 Global procurement intelligence advisory firm, SpendEdge, has announced the release of their ‘Global Internet Services Procurement Research Report.’ The insights and data in this report provide a strategic analysis of the supply markets, factors influencing purchasing decisions, procurement best practices, pricing models, supplier landscape, and an analysis of the supplier capability matrix for the telecom and networking industry. This report breaks down the data and analysis behind the procurement of stick packaging and acts as an all-inclusive guide for making smart purchasing decisions. “The rising demand for internet services from the IT, financial, and retail sectors are expected to drive the market growth,” says lead SpendEdge procurement analyst Angad Singh. “Suppliers are enhancing the internet connections to meet the customer expectations for internet services to meet the rising internet needs,” added Angad. Internet services provide users with the ability to store and access data remotely through any electronic device via cloud services. Buyers need to consider whether the suppliers provide phone system, business TV, or e-mail access. Engaging with a supplier who provides these services can reduce operational complexities and the total cost of internet management. Buyers do not have control over downtime caused by maintenance or technical issues. The supplier needs to be proactive in dealing with these snags to ensure the seamless flow of day-to-day operations. Flat rate pricing, usage-based pricing, and congestion pricing are the popular pricing models adopted in the internet services market. SpendEdge analysts note that the congestion pricing model shows high growth potential since it helps buyers in reducing additional traffic costs. This pricing model provides suppliers with the option to take necessary steps by understanding the congestion levels and accordingly increase the network capacity.